Pineapple is one fruit that almost everybody enjoys eating, maybe because of its sweet taste. The outside may appear ugly, but you cannot underestimate the refreshment you will get from the sumptuous and juicy inside. 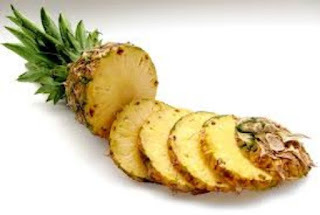 This tropical fruit is packed with multiple functions, and in this post we shall be looking at 27 health benefits of Pineapple. We shall be looking at the health benefits of pineapple as it relates to the skin, hair and overall health. Check the list below for full details. This exotic flavour is like an elixir for our skin, especially to get rid of stubborn pimples. Want to know the scientific reason why pineapples make our skin awesome? Well, this fruit gives the collagen synthesis in your body a boost. In order to exfoliate your skin, you can use freshly crushed pineapple wedges. Rather than depend on creams, pineapples is an inexpensive, yet effective method of making feet cracks vanish. Have you wondered why your nails look dry and brittle? No? Blame vitamins A and B. Dry skin looks dull and unattractive, doesn’t it? But the blazing summer heat and pollution do not help our cause. Pineapple to the rescue! Pineapple, when used alongside coconut oil, offers relief from chapped lips. A few dietary changes can help you prevent hair loss. Pineapple in your lunch/dinner routine is one such solution. When your scalp feels like a battleground of itches, try pineapples for instant soothing. Pineapple extracts are known to possess hair thickening properties. Pineapples are a rich source of antioxidants that help fight free radicals in the body, thereby preventing further cellular damage. Nobody likes to sneeze and sniffle for most of the day. This exotic fruit is abundant in vitamin C and bromelain, which fight against microbial infections. The rich amount of manganese present in pineapples helps in strengthening bones and connective tissues. Eating pineapple strengthens your gums, and keeps your teeth healthy and strong. Macular degeneration is a condition in which adults lose their vision. Beta-carotene present in pineapples improves vision. Pineapple fruit is well-known for its anti-inflammatory properties that prevent inflammation in arthritis patients and gives strength to the bones. Pineapples help prevent sinusitis. They are also effective in curing sore throat, gout, and swellings. Do you know that pineapples are also proven to be beneficial against all type of cancers? The abundance of antioxidants in pineapples helps fight the free radicals. Free radicals cause atherosclerosis, which can be easily prevented by the antioxidants in pineapples. Powerful antioxidants present in pineapple help lower the cholesterol levels in the body, thereby preventing heart diseases. Vitamin C and antioxidants present in pineapples boost the immunity system of our body. Pineapple is rich in bromelain, vitamin C, and dietary fiber that promotes digestion. You must have noted that the anti-inflammatory properties of pineapples come in handy in treating a lot of conditions. They also helps in reducing inflammation in bronchial tubes, which generally arises due to bronchitis. Catarrh is caused by the inflammation of the mucus membrane in one of the airways or cavities of the body. This disorder can be prevented by eating pineapples regularly. If you are suffering from high blood pressure and hypertension, then you must start eating pineapples regularly. Pineapple contains the digestive enzyme (bromelain) so a diet rich in pineapple helps clear certain intestinal parasites such as tapeworms. Consumption of pineapple juice can help avert nausea or morning sickness.